Two billionaire businessmen accused of stalling work on the London Olympics project could cost taxpayers £700m, Ken Livingstone has said. Developers David and Simon Reuben have been accused by London's Mayor of destabilising the consortium behind Stratford's planned £4bn Olympic City. The Mayor sparked a row on Tuesday when he told them to "go back to their own country" and has refused to say sorry. The Reuben brothers said they were completely committed to the Olympics. Speaking at his Question Time at City Hall, Mr Livingstone said deadlines for planning applications were already being missed and, if this continued, taxpayers may have to cover costs to get building work finished on time. He said: "They (the Reubens) do not have a track record of successfully undertaking major developments, or of working in partnership...and without them, collapsing into squabbling and litigation." He refused to apologise for his remark in which he told the brothers to "go back (to their own country) and see if they can do better under the ayatollahs". "I would offer a complete apology to the people of Iran to the suggestion that they may be linked in any way to the Reuben brothers," he said. "I wasn't meaning to be offensive to the people of Iran," he said. London Assembly Conservatives said the brothers were not Iranian, but born in India of Iraqi-Jewish parents. A spokesman for the Reubans brothers said the mayor appeared to have been "deliberately misinformed" about their role in the consortium. "They have worked ceaselessly to try to move the project forward for the benefit of London and the Olympic project. "If the Mayor cares to have discussions with either David or Simon Reuben, then we are confident that he would arrive at a more balanced view," he added. 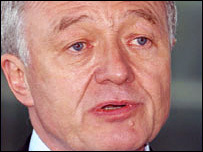 Conservative London Assembly member Brian Coleman said Mr Livingstone should withdraw his remarks. He said that even someone with the "business brains of a newt" should know that it is unwise to make such statements at such a commercially sensitive time.